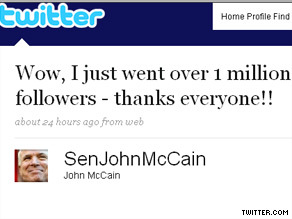 Sen. McCain now has more than a million followers on Twitter. WASHINGTON (CNN) – Arizona Republican Sen. John McCain has passed an online milestone. The former Obama rival now has more than a million followers on the microblogging and social networking site Twitter. In a statement announcing the achievement, McCain said he was "both honored and humbled" to have amassed such a following. "It has been one of the most enjoyable experiences in my long political career – not too bad for an old guy," McCain added. McCain's increasing use of Twitter marks a major shift from the presidential campaign when he said he "never felt the particular need to e-mail." Earlier this year, McCain also became the proud owner of new BlackBerry. In addition to slightly more than a million followers on Twitter, McCain boasts more than half a million supporters on Facebook. McCain is one decent GOP that we can relate to. He may have harsh critics online, in newspapers and the TV, but he somehow makes a few sensible statements now and then that make us pensive.